People who get a blacklegged tick bite may be getting more pathogens than they expected. A new study found that ticks are almost twice as likely as previously believed to be infected with two pathogens—the bacterium that causes Lyme disease and the protozoan that causes babesiosis. Almost 30 percent of the ticks were infected with the agent of Lyme disease. One-third of these were also infected with at least one other pathogen. The agents of Lyme disease and babesiosis were found together in 7 percent of ticks. The researchers collected thousands of blacklegged ticks from over 150 sites in Dutchess County, New York, an area with high incidence of tick-borne illnesses. They also collected ticks that had fed on different kinds of wildlife, including birds, rodents, opossums, and raccoons. Ticks acquire pathogens from feeding on infected hosts. DNA from each tick was extracted and tested for the presence of several pathogens. "Mice and chipmunks are critical reservoirs for these two pathogens, so ticks that have fed on these animals are much more likely to be co-infected," said Michelle Hersh, an assistant professor of biology at Sarah Lawrence College, past postdoctoral researcher at the Cary Institute, and lead author of the study. "Mice and other small mammals are often particularly abundant in habitats that have been fragmented or degraded by human activity," said Richard Ostfeld of the Cary Institute of Ecosystem Studies. "That means these patterns of co-infection might get worse through time as humans continue to impact forest ecosystems." The researchers also considered another emerging pathogen, Anaplasma phagocytophilum, the bacterium that causes anaplasmosis in humans. Fortunately, ticks were not more likely than expected to be co-infected with Anaplasma and the Lyme disease bacterium. The researchers determined the proportion of ticks infected with each pathogen individually, then calculated the rates of co-infection expected by chance alone. Not only was co-infection with the agents of Lyme disease and babesiosis greater than expected, but rates of triple infection with the agents of Lyme, babesiosis, and anaplasmosis were about twice as likely as expected. 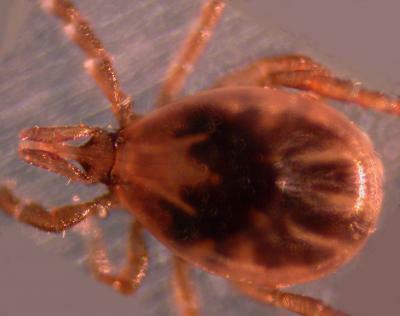 "People in tick-infested parts of the United States such as the Northeast, Mid-Atlantic, and Upper Midwest, are vulnerable to being exposed to two or three diseases from a single tick bite," said Keesing. "And, of course, that risk increases when they're bitten by more than one tick."